There are lots of portals from where you can download fonts to use in your projects: one of the best-known for the variety and quality of its free fonts is Fontsquirrel. Commercial Desktop Use - Create commercial graphics and documents. 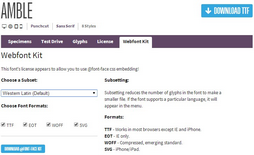 @font-face Embedding - Embed the font in your web site with CSS. Ebooks and PDFs - Embed fonts in eBooks and portable documents. Applications - Embed the fonts in applications and software. ▪ Click on the font you want to use to proceed to the next page, and here you must open the Webfont Kit section. 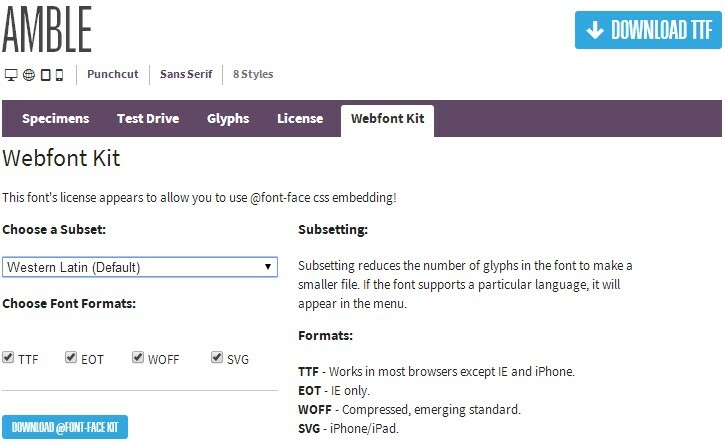 ▪ Choose the Subset that you want to use from the menu, and then select all the formats available for the font (TTF, EOT, WOFF, SVG), then click on the Download @font-face kit button to start the download. When the download is completed, you will have a zipped folder on your computer that contains all the files needed by WebSite X5 to use a web font (see How to use web fonts).